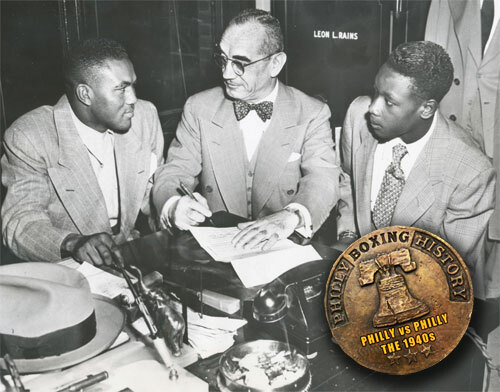 During the 1940s, Philadelphians Bob Montgomery and Wesley Mouzon had a back-to-back, two-bout, classic series of lightweight fights that illustrate the quality of boxing rivalries of the era. The 1940s were a particularly sensational era of boxing, and the fighters were not timid about facing each other. 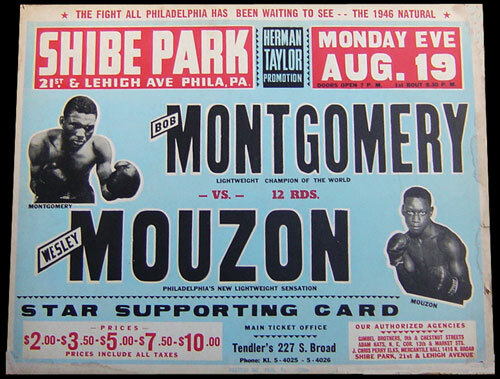 Montgomery-Mouzon was a typical – and yet extraordinary – example of boxing in the 40s. 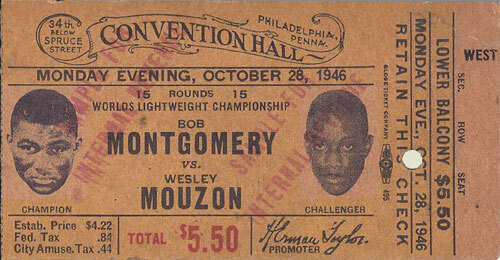 Bob Montgomery was two years into his second reign as NYSAC world lightweight champion when he first faced Wesley Mouzon, a nineteen year old teenage sensation who had already defeated Eddie Giosa, Santa Bucca, Dorsey Lay, Leo Rodak, Nick Moran, and surprised the boxing world by fighting to a draw with the great Ike Williams – as an eighteen year old! 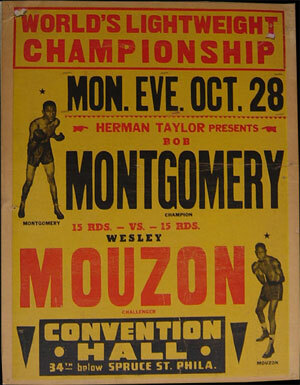 Montgomery took both of his titles in bouts with Beau Jack at Madison Square Garden, and although he was the current champ, his first fight with Mouzon was a 10-round non-title bout. These days, having to accept a fight against the champion, without the title at stake, would make most modern fighters turn their noses up at the offer. 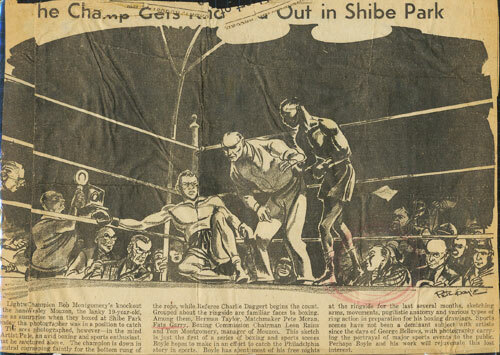 But in 1946, the nineteen year old Mouzon grabbed the chance to prove himself against the man many believed was the best lightweight in the world. Despite Mouzon’s solid resume, few thought he had a chance against the Bobcat, and Montgomery was installed as a 12-5 betting favorite for the fight. 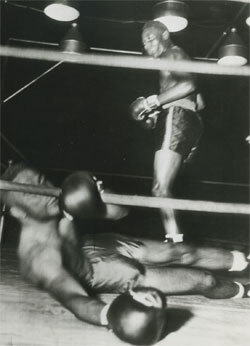 Most fans were waiting for Montgomery to fight a rematch with Ike Williams, who had significantly rebounded from a KO defeat at the hands of Montgomery two years prior. However, the evening of August 19th belonged to Wesley Mouzon. Mouzon stepped to the injured Montgomery and fired away with a volley of punches that concluded with a left hook. That final punch sent the champion to the canvas for the full ten count. It was as if lightning had struck in the lightweight division. Although Mouzon’s knockout made him the new star among 135-pounders and made a case that he was the best of them all, Wesley did not win the title. However, this big upset was the greatest victory of his career – and it spawned an immediate rematch with Montgomery’s belt on the line. Three months later – THREE MONTHS later – the pair met again at Convention Hall for the lightweight crown, with more than 12,000 fans watching. This time, Mouzon was the favorite, with many thinking Montgomery would fall to the youngster again. 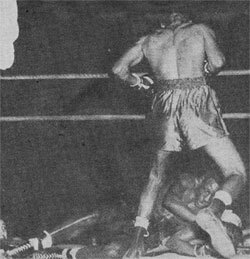 However, Montgomery proved his greatness by coming away the winner after an eighth round knockout. Mouzon out-boxed Mont-gomery in the early rounds, but the champion managed to land a few solid shots that foreshadowed the ultimate end. Still, Mouzon stayed in the fight and continued to build a lead. However, in round five, Montgomery drove a devastating body shot to Wesley’s stomach that changed the momentum of the battle. Mouzon seemed to wither from the punch and immediately began to fade. Montgomery kept driving forward with his mauling style, landing more and more as the fight progressed. Mouzon occasionally tried to find another punch like the one that earned his victory in their last meeting, but it never came. Finally in round eight, Montgomery cracked Mouzon with a right uppercut – left hook combination that flattened the youngster. Mouzon fell to the floor, draping over the bottom rope, where he took the full ten count from legendary referee Charley Daggert. After the fight, Mouzon said that he wanted a rubber match with Montgomery. However, he would never fight again due to a detached retina. Montgomery fought many all-time greats during his Hall of Fame career, but many believed his sensational performance against Mouzon was the very best of his career.